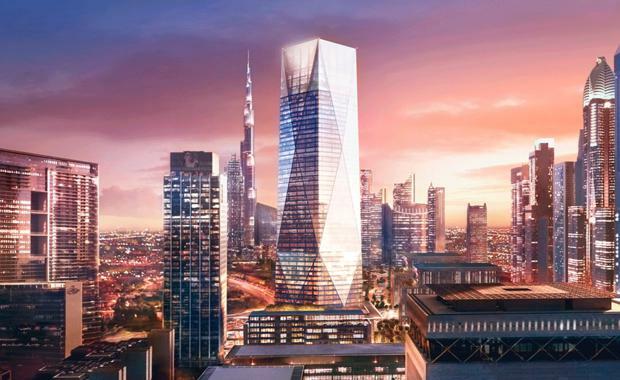 Construction has officially begun on a new crystalline skyscraper designed by Foster + Partners for the Dubai International Financial Centre district (DIFC). The tower, to be named ICD Brookfield Place, is a 1.5 million square foot office and retail mixed-use development that comprises over 900,000 square feet of Grade A lettable office space adjacent to a 150,000 square foot retail centre with shopping, dining, fitness and private club facilities. The centre piece will be a 53-storey office block with a faceted glass facade designed to reflect sunlight. SkyriseCities, it is the first tower to be built in the area since the financial crisis of 2008. The office tower and retail building will be connected by several pedestrian pathways and a 31-metre-high, 18,000 square foot landscaped public realm that will showcase a range of arts and cultural events. The public garden and a new retail connection will link the food emporium and public realm at ICD Brookfield Place to the existing DIFC gate precinct.